ROW 2 Ch 3, turn. FPDC around each st across and DC in top of ch-3 turning chain. ROW 3 Ch 3, turn. BPDC around each FPDC of prior row. DC in top of ch-3 turning chain. ROW 4 Ch 3, turn. FPDC around eah BPDC of prior row. DC in top of ch-3 turning chain. Repeat rows 3 and 4 until you have reached 74 inches or desired length. Make sure you work BPDC around the FPDC of each row and vise versus to create the pattern on each row. Twist scarf once and put wrong sides together and whip stitch closed the seam. Make sure right sides are facing out at seam. 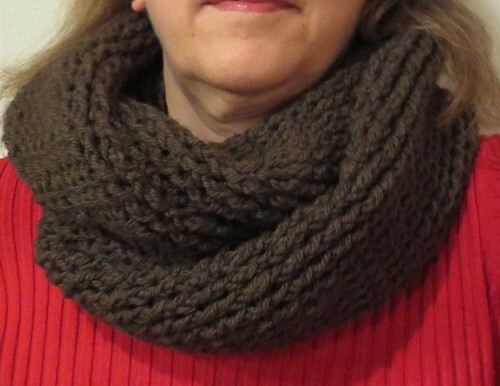 Wrap around neck once and then cross in front of you and wrap it around your neck again for cowl. Bring up one section for a hood if desired. 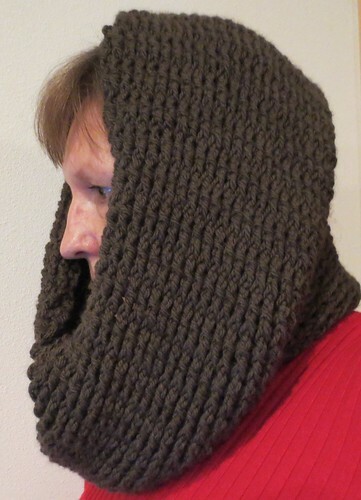 I love these cowl scarfs. They’re so versatile. Thank you for the ideas. I have a wonderful partner who likes to gear me up for quading. (four wheel motor bikes) in the bush.